On Wednesday December 17th, 2014, a Pastor at Redeemed Christian Church of God, Yemi Osinbanjo was announced as the running mate of General Muhammadu Buhari. “Professor Yemi Osinbajo is a Senior Advocate of Nigeria and Senior Partner in the Law firm of Simmons Cooper Partners. His tertiary education was at the University of Lagos and the London School of Economics and Political Science obtaining the LLB and LLM degrees respectively. “He was appointed Lagos State Attorney General and Commissioner for Justice in 1999 and reappointed for a second term in 2003. During the period of his public service, he commenced the Lagos State justice reform project. A prominent feature of that project was the establishment of the Directorate for Citizens’ Rights (DCR) which provides free legal services and legal representation to indigent citizens of the state. This initiative gave a voice to many who would otherwise not have a way to access their rights. “Prior to that appointment, Osinbajo, a Professor of Law, was the Head of Public Law at the Faculty of Law, University of Lagos. Between 1988 and 1992, he was the Special Adviser to the Attorney-General and Minister of Justice of the Federal Republic of Nigeria. “He also served as a staff member of the United Nations and Member of the United Nation’s Secretary General’s Committee of Experts on Conduct and Discipline of UN Peacekeeping personnel around the globe, including United Nations Centre on Transnational Corporations, the United National African Institute for Crime Prevention, the International Criminal Court for Rwanda in Arusha, Tanzania, the Department of Peacekeeping Operations and the United Nations Peace Operations in Somalia (UNOSOM). He is currently an Ethics Advisor to the Ethics Committee of the African Development Bank and is a non-executive Director of Citibank. “Prof. Osinbajo is Co-founder and Board Member, Convention on Business Integrity and the Justice Research Institute Ltd. In 2007, Prof. and his wife Oludolapo founded “The Orderly Society Trust”, a non- governmental organization that is dedicated to the promotion of Christian ethics and orderliness”. 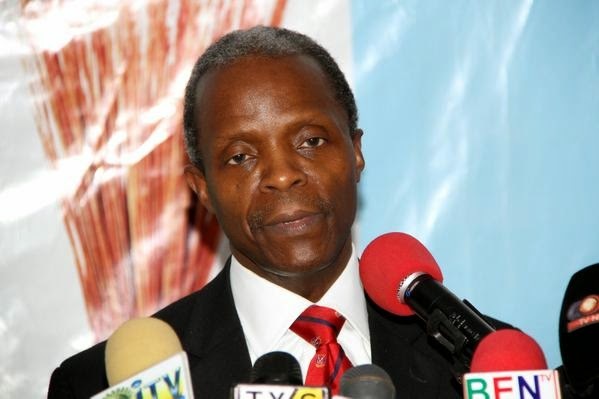 “Professor Osinbajo has authored, co-authored and edited several books and publications including The Unification and Reform of the Nigerian Criminal Law and Procedure Codes ; Law Development and Administration; The Annotated Civil Procedure rules of The Superior Courts in Nigeria and Cross Examination: A Trial Lawyer’s Most Potent Weapon. He was born on the 15th of August, 1953 in Lagos State Nigeria. He is blessed with Children and currently serves at Olive Tree Parish of the Redeemed Christian Church Of God. Nigerian leaders now is MALAM & PASTOR, we thank u oh God. Pls. Pls. & pls. do not disappoint us as d previous did, all our eyes are on u. U are d first RELIOUS LEADERS to rule our country by God grace. Since 2011 we are at home without work looking our famies praying 2 God 4 change, and our prayer now answered. May God help us.